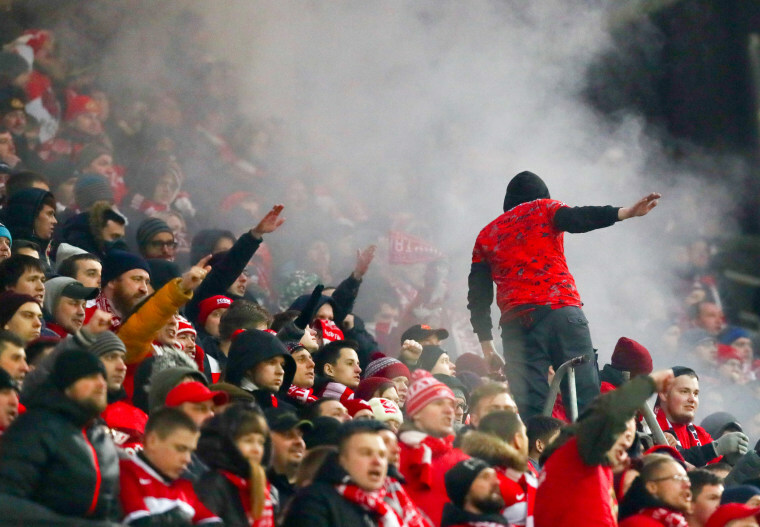 Nineteen incidents of abusive chants were recorded this season, up from two last season, according to London-based Fare Network and Moscow-based Sova Center. MOSCOW — Racist and anti-gay chants have become more common in Russian soccer as the country prepares to host the World Cup, even as overall incidents of discrimination declined. Nineteen incidents of abusive chants were recorded this season, according to an annual report from the anti-discrimination Fare Network and the Moscow-based Sova Center released Wednesday. That compares to two cases the season before, and 10 the year before that. Victims included players from the French national team, who were targeted with monkey chants during a game against Russia in March, and Liverpool youth player Bobby Adekanye, who was racially abused by Spartak Moscow supporters. Russian national team goalkeeper Guilherme Marinato, a naturalized citizen who was born in Brazil, was twice targeted by Spartak fans calling him a monkey. In another case, a regional governor told local media that the club his administration funds in the city of Vladivostok would not sign any black players. Last month, Nigeria defender Bryan Idowu, who was born and raised in Russia, told The Associated Press that some fans in the country viewed racist abuse as a tactic to distract opposing players, rather than as a statement of ideology. "I think most of them do that to put pressure on a player psychologically, maybe so he doesn't want to keep playing," he said. "It could just be because someone finds it funny." Overall, cases of discrimination in Russian soccer fell to 80, the lowest since the 2013-14 season, according to Fare. Fare executive director Piara Powar said there is also a growing shift by far-right fan groups to racist chants because visual displays like banners are more easily tracked by surveillance cameras in stadiums. "Some of their clubs have got their procedures in place for dealing with things that are very obvious, for bringing down banners," Powar said. "That leaves people able or free to chant things and that's a far more difficult thing to police." There was a fall in the number of discriminatory banners and other visual displays, down from 75 to 52. More blatant extremist symbols and racist slogans have largely disappeared from stadiums in recent years, often replaced with coded messages using Viking runes and other symbols with significance on the Russian far right. In one notable case, Zenit St. Petersburg fans hailed convicted war criminal Ratko Mladic as a hero with a banner unfurled at a Europa League game in November. That attracted a fine and partial stadium closure order from UEFA, European soccer's governing body. The Fare Network, which helps FIFA and UEFA investigate racism cases, is planning to open two "Diversity Houses" in Moscow and St. Petersburg during the World Cup, where issues of discrimination in sports will be discussed. "It's a celebration of diversity," Powar said. "It showcases the rise of ethnic-minority players across the continent and looks at the growth of women's football, looks as issues associated with Russian football." Fare is also issuing a guide to Russia for visiting fans and operating a helpline for fans from minority groups to report harassment or attacks. The organization urges fans from minority groups to travel to the World Cup but recommends caution in unfamiliar surroundings and awareness of issues such as racial profiling by Russian police.